When people ask me why I take photos, I tell them it all started with a travel bug. It was a yearning for adventure and exploration that got me hooked on capturing the moments and experiences of my travels. Recently, I had the opportunity to explore the wild regions of Peru with Killa Expeditions that easily became my best travel experience. With its distinct local culture, unique landscape, and rich history, Peru is a place unlike any other. I embarked on a 4 day trek through the Andes Mountains of the Cusco Region, starting at Tinqui village and ending at Vinicunca Mountains aka Rainbow Mountains. This was then topped with a trip to the most mind boggling spot on the planet, Machu Picchu – a UNESCO Heritage site. 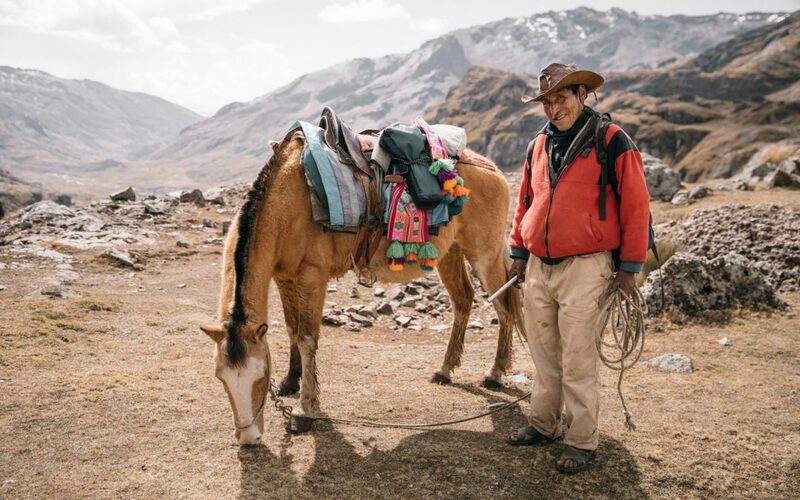 Starting at 3300m (10,827ft), our trip with Killa Expeditions started off with an introduction to our guide, porters, and chef all of whom would be trekking with us through the Andes to help transport our gear and prepare warm meals throughout the trek. Through every step of the way, these amazing human beings were constantly in high spirits and always ready to help. The experience wouldn’t have been the same without them and trekking with them made this one of the most immersive cultural trekking experiences you can ever have. As this trek climbs to a staggering 5050m (16,568ft), we had made sure to prepare ourselves and acclimatize to the altitude in Cusco (3399m) a few days before. Throughout the entire trek, you will experience everything from glacial, snow-capped peaks to turquoise lakes, passing through multiple high passes and rocky terrain. We rarely saw a soul in sight other than our own party and had nature’s playground all to ourselves nearly the entire time. Truly off the beaten track, this trek totaling 52 km (32.3 miles) is located in one of the most secluded areas in the region. And if you’re an animal lover, you’ll definitely have numerous opportunities to get up close with horses, dogs, alpacas, and llamas, that all belong to the locals who call the mountains home. Check out Killa Expedition’s Rainbow Mountain Trek here or any of their other treks throughout the Cusco Region here. Philip Nguyen /ˈfɪlᵻp/ [ŋʷǐˀən] is a self-taught freelance photographer born and raised in Houston, Texas. Philip fell in love with traveling at a young age and later found sanctuary in the unspoiled elements of the outdoors. A technical mind with a yearning for artistic escape, he has adopted photography to visually interpret the stories of his travel adventures, changing environments, and the people around him with a focus on mood and feeling. In the past year of being on the road throughout North & South America, Europe, and Southeast Asia, he has helped tell the stories of those he has met around the world and captured some of the most remote and undiscovered gems on this planet. And with that, amassing a loyal following who share the same passion for adventure and travel. Philip is available for photography work worldwide.